Lots of new features in Apple's latest version of OS X. Upgrade and get an improved Mac. It’s really that simple. El Capitan, OS X 10.11 ( ), arrives for everyone September 30, but I’ve been using it all summer. In these days of free operating-system updates, major OS X updates feel a whole lot more routine than they used to be. 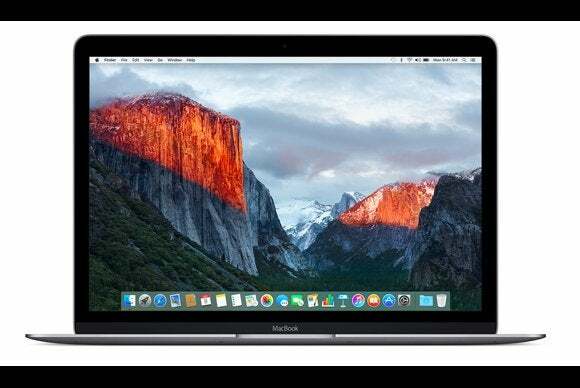 Apple has chosen not to roll out major OS X features piecemeal throughout the year, though, which still makes this the biggest change your Mac will experience this year. El Capitan, named after the large granite rock formation inside Yosemite National Park, is very much a refined version of OS X Yosemite, a recognizable progression from its predecessor. (In iPhone terms, it would be Yosemite S.) Apple says this update is all about a refined experience and improved performance. But it’s traditional for Apple to take its no-big-deal updates and pour in a bunch of new features anyway, and El Capitan is no exception. This is a packed release, but one that makes sense as a follow-up to Yosemite. Before we get started, it’s worth recapping what this El Capitan business is all about. El Capitan is Apple’s marketing name for OS X version 10.11, the latest update to your Mac’s system software. If your Mac is running Yosemite (10.10), Mavericks (10.9), or Mountain Lion (10.8), it can run El Capitan. Beginning September 30, you can download El Capitan straight from the Mac App Store. And if you’re running an older version of OS X, you don’t need to do interim upgrades—you can go straight to El Capitan from Snow Leopard or later. If the update will be free and readily available, what’s the big deal? Often people are trepidatious about upgrading their computers. If an app you rely on is incompatible with the new version, your entire workflow can be broken. It’s worth being careful and checking with the makers of any apps you rely on before upgrading—most will post compatibility information on their websites. In the case of El Capitan, a few of the apps and utilities I rely on weren’t initially compatible, but most have already been updated as a result of Apple’s summer-long testing period. Most major OS X upgrades feature a lot of under-the-hood security improvements, which is a good reason to stay up to date, but some of those changes can also break software. Several of the apps I use, including SuperDuper and Default Folder X didn’t work properly with El Capitan, but SuperDuper has already been updated to regain compatibility and Default Folder X has a new version on the way (and a workaround in the meantime). Bottom line: I’ve found El Capitan to be a stable update, but you should always back up your system and check with the makers of your most important apps about compatibility before installing it. We all use our Macs in different ways—and even the same person can use a giant 5K iMac in a different way than they use an 11-inch MacBook Air. (I am one of those people.) My gut feeling is that there’s a devoted (but small) subset of Mac users who love using Mission Control (formerly Exposé) to arrange their windows and workspaces, or frequently use Full Screen mode for apps. If you’re one of those people—or if you’ve always been tempted to improve how you organize your workspace, I’ve got good news for you: El Capitan offers quite a few boosts to Mission Control and Full Screen Mode. The most notable addition is the new Split View feature, which appears to be designed to be reminiscent of the Split View feature that appears on some iPads in iOS 9. Unlike the iPad, though, Mac users have always been able to run two windows next to each other. Still, what Split View is really doing is adding an extra dimension of utility to full-screen view. Now full-screen view doesn’t just have to feature one app stretched out to take over your entire screen—you can split the space between two apps, one on the left side and one on the right. Split View allows the user to display two apps side by side. Entering Split View is actually fun, and quite clever on Apple’s part. If you click and hold on the green plus/maximize button in a window’s title bar, you’ll be prompted to choose which side of the screen you’d like that window to be placed on. Then Mission Control will activate on the other side of the screen, letting you choose any of your currently open windows to use as the first window’s split-screen buddy. It’s fast, cool looking, and efficient. Converting full-screen mode to split-screen mode isn’t without its interface quirks. I noticed that, depending on how an app presents itself in full-screen mode, sometimes it could be very hard to tell which app was active/frontmost. That sometimes led to unexpected behavior—for example, I tried to zoom in on a PDF in Preview by spreading my thumb and index finger on the trackpad, but it didn’t work because I hadn’t clicked on the window to activate Preview yet. Since it seems that Split View is just a modified version of the old full-screen view, there are probably going to be some quirks like this—with apps assuming they’re the only app you can see because you’re in full-screen mode, even though they’re not—until they’re modified to adapt to the El Capitan world. Like full-screen view, I’m not sure Split View is going to appeal to anyone but users of laptops, and even then, it’s more likely to be appealing on smaller laptops. If you’ve got a large monitor, full-screen view is often overkill, because few apps are designed to take up all that space. (There are, of course, exceptions—when I’m editing audio in Logic Pro X, it’s using every pixel of my 5K iMac screen.) But at least with El Capitan, you’ve got the option of having two different apps share full-screen view. On a smaller display, such as my trusty 11-inch MacBook Air, it’s a nicer experience. 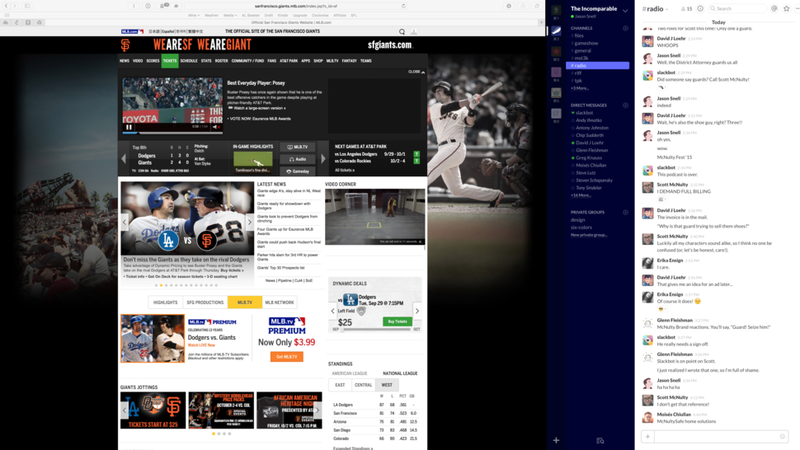 When you engage Mission Control, app windows are displayed in a way that mimics their actual placement on your desktop. Perhaps my favorite addition, though, is to Mission Control itself. The entire feature feels friendlier and makes more sense than it ever has before. Mission Control now does a much better job of organizing and presenting your open windows. Every window gets its own thumbnail, rather than piling all of an app’s windows in a big stack. And when you engage Mission Control, your windows don’t fly all over the place like a giant game of 52 Pickup—they slide around in order to bring every window into view, sure, but the feature keeps geography in mind. This means that a window that’s in the top-right corner of the screen will generally stay near the top-right corner when Mission Control is activated. The Spaces Bar—that strip at the top of the screen that appears when you activate Mission Control—has also gotten a major upgrade. First, it’s collapsed by default, giving more space to your windows when you activate Mission Control. When you move your cursor over the Spaces Bar, it expands. You can also drag a window to the top of your screen, and Mission Control will automatically activate with the Spaces Bar expanded, so you can quickly toss a window into a new or existing workspace. Finally, in a boost to the new Split View feature, if you move your cursor over a space that contains two apps in Split View, you’ll see a small icon that allows you to blow the Split View apart—bringing both windows back to your existing workspace. When you click it, you see the two windows slide back into their place in the Mission Control landscape. Between Siri and Spotlight, Apple continues to build up its collection of searchable data sources. On iOS, Siri and Spotlight seem to be merging and mingling in a bunch of interesting ways. On OS X, those data sources crop up in a bunch of different places: They’re in Spotlight, yes, but you’ll also find them in Safari. 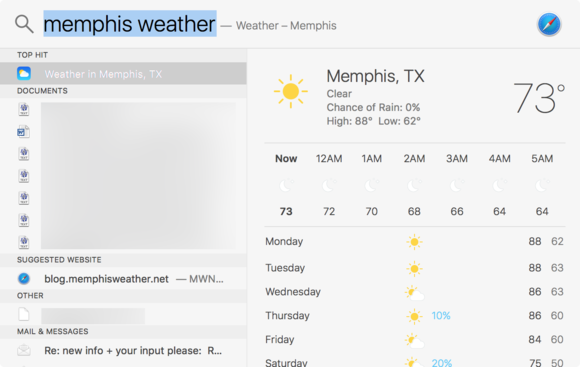 With El Capitan, Spotlight and Safari both have access to weather, stocks, sports, transit, and web video, as well as support for natural-language queries. 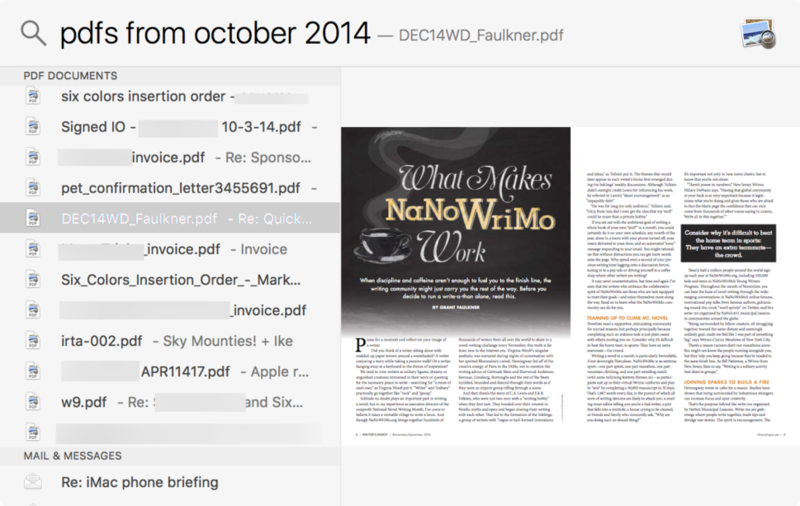 Spotlight’s natural lanaguage support means you can type queries like, “pdfs from october 2014” and Spotlight will show the proper results. Yes, this means you should be able to type “san diego chargers standings” into Spotlight and immediately be given the bad news from the AFC West, or “phoenix az weather” and get the bad news from the desert west. 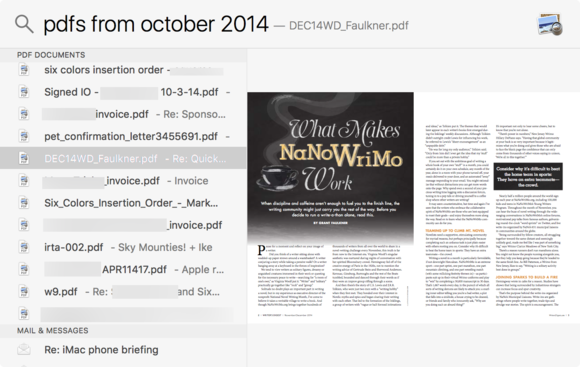 It also means you can type queries like “pdfs from june 2013” or “presentations from august 2012” into Spotlight or Finder and actually get the result you’re expecting. I like this approach, because the fact is that many people search using natural language queries regardless of whether their search engine of choice supports it. A lot of us want to type, “how do I delete my Facebook account” into Google, rather than carefully crafting a string of search terms. So Spotlight gets smarter, we get to be lazier, and it should all work out. That said, the quality of the results from these data sources needs to be tightened up. When I search for “arsenal standings,” I get an English Premier League table, but without point totals. A search for “cal football schedule” shows me a weird amalgamation of dates, many of them listed as Dec. 31, and “pac-12 standings” displays an unsorted list of conference records. Likewise, if I type “memphis weather,” I don’t get the weather near Graceland, but the weather in Memphis, Texas, population 2290. Not smart enough, Spotlight. Think “Memphis,” and most people think Tennessee, except for Spotlight (and the citizens of Memphis, Texas). There’s one improvement to Spotlight that I applaud wholeheartedly, and it has to do with the Spotlight window itself. Last year, Yosemite cut the cord between the Spotlight window and the Spotlight icon in the top-right corner of the Menu Bar. It floated in the middle of the screen, disconnected from the icon it was supposedly attached to. Now with El Capitan, you can move the Spotlight box anywhere you want, and resize the results window, with the menu bar icon serving as nothing more than a shortcut. With El Capitan comes a new version of Safari, version 9, and it’s got some clever new features. I have to admit that I still use bookmarks (and don’t use RSS), and I really enjoy the new Pinned Sites feature in Safari 9. Pinned Sites are like mega-bookmarks—or if you prefer, they’re a simpler, more visual version of the Favorites Bar. Drag a tab into the left corner of Safari’s title bar and it will stay there permanently, with a little icon (or letter if the site in question hasn’t built a special custom icon for use with Pinned Sites) to distinguish it. Pinned Sites are kept refreshed, so with one click you can see what’s new on your favorite site. Clicks that lead to other pages on the site are loaded in the pinned site’s tab, but external links all open in separate tabs, keeping your pinned site right where it is. As someone who likes to bookmark a few very-favorite sites and visit them regularly, this has the makings of a cool feature. Pinned Sites are represented by icons on the left side of the Tab bar. This feature does change Safari’s keyboard shortcuts and tab behavior, however. Since Pinned Sites are always open, if you try to close a Safari window when viewing a Pinned Site, it will switch you to a new tab instead. If you have a single tab open that’s not a Pinned Site, it will close the entire window. But if you open a new window and navigate back to the Pinned Site, you’ll find that it’s still on the page of the Pinned Site that you last visited. If you’re used to navigating the first item in the Bookmarks Bar by typing Command-1, you’ll also have to get used to a change. Command-number shortcuts are now reserved for navigating Pinned Sites and browser tabs, moving from left to right. I used to have my personal weather station page as my first Bookmarks Bar item; now I’ve made it my first Pinned Site, so I can keep the same shortcut. You can also access all the Bookmarks Bar items by adding in the Option key, in the format Command-Option-[number]. El Capitan is as solid as the giant granite monolith that towers over Yosemite Valley. Upgrade, and get an improved Mac. It’s really that simple.